Renovations to H.M. Comer Hall were completed August 2018. 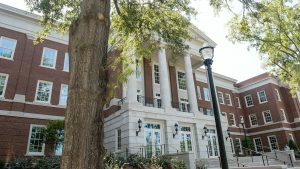 TUSCALOOSA, Ala. — The University of Alabama College of Engineering officially celebrated the opening of the newly renovated H.M. Comer Hall with a ribbon cutting ceremony today. Over the past 17 months, H.M. Comer Hall has undergone a $24.6 million renovation. Due to the College of Engineering’s continuous growth, there was a need for a unified space to better support students, faculty and staff. The updated facility offers a centralized space for the College’s administrative offices, student services and external affairs and development. Renovated with a student-minded focus, the second floor of the building houses information technology and engineering services, financial affairs, the Brasfield and Gorrie Advising Center and the College’s career center and cooperative education program in the ACIPCO Engineering Career Development Center. The College’s new Patterson Welcome Center highlights their world-class research faculty and state-of-the-art facilities. Also located on the first floor is the student innovation lab called The Cube, the McAbee Grand Foyer, the Marczak Student Lounge and a 152-seat lecture hall. The building’s third floor is home to a departmental suite with offices for all seven department heads, the dean’s office and the Kilgore Parlor. “We are so very grateful to all of the donors who contributed to this effort,” Karr said. The building makes a statement that the UA College of Engineering is a first-class institution and will help the College continue to recruit the best and brightest students and faculty.